There is currently a mini-movement underway in scholarship to whitewash the Spanish Jesuit conflict with the indigenous peoples of Guåhan and its sister islands, led by the modern-day Jesuit Francis Hezel. I first encountered Francis Hezel when he gave a presentation at the Marianas History Conference on “The Spanish-Chamorro Wars.” His argument sought to minimize any negative impact or intimidation that the Spanish might have caused to the Chamorro people by invading their island with military force, burning villages, executing Chamorro people for what most people today would consider petty or negligible offenses, and forcing them to convert to Catholicism. Francis Hezel argued that the presence of guns did not constitute intimidation. He argued that probably no one was forced to convert to Catholicism. He argued that the actual military conflicts between the Spanish and Chamorro people — using only Spanish records as his research sources — were negligible. It is very difficult to square what I know of the massacres and burned villages on Guåhan with Hezel’s desire to exculpate those old Spanish figures. One cannot with any degree of historical accuracy extricate the Jesuit priests, even those who sometimes advocated less violence toward the Chamorro people, from their undeniable entanglement with the Spanish military. I can only attribute Hezel’s perspective to religious bias. It doesn’t seem to be rooted in the historical record. The image that accompanies this post is originally from the World of Warcraft, and is called the Acolyte of Pain in the Hearthstone spinoff game. San Vitores is known for practicing forms of self-mutilation and discipline, including the cilice (a crown-of-thorns-type band) and self-flagellation. This is usually glossed as a Catholic spiritual tradition of promoting faith and inner strength, but I see it differently. Such hatred of the flesh, of one’s own flesh, of the fleshly world. Such distance and distraction. Obsession, hatred, desire, starvation. I do not pity such people, per se. They have perverted the very meaning of what it is to be human. 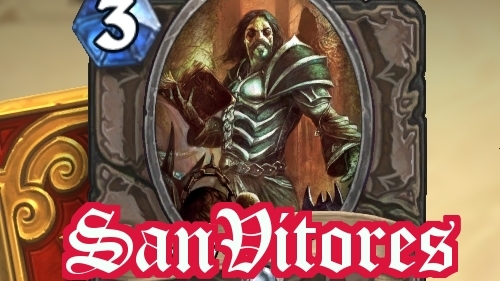 San Vitores sought nothing more than his own death as the ultimate reward for service to Ner’zhul Dios. Right on, Isa. How does Hezel rationalize the term, “la reduccion?” San Vitores would not return to Guam unless and until he secured the funding of an armed military to ensure christian compliance amongst we “savages.” Reading the accounts of our lives at the time of the arrival of the spaniards tells me our way of life was changed forever from the violent invasion & occupation of that crumbling empire. In California, we can look to the legacy of another jesuit freak, Junipero Serra. The indigenous experience under the spanish missions wrought violence, massacres, slavery and of course, the land grab to the People. Our experience in the Mariana is a parallel story. ps. In 1992, the Matapang/San Vitores statue in Tumon depicted Matapang standing over the freak with a spear to his back. When was Matapang removed?